Here in Los Angeles, Han supporters are out in droves, clamoring for the mayor to throw his hat in the ring for 2020. Earlier this week Mayor Han had criticized the last three presidents, saying Taiwan’s economy had been ruined by three graduates of National Taiwan University’s law school. At this event, he upped the ante. The ruling party has already been in power for three years. It doesn’t matter what reasons, excuses, and slogans you come up with. The point is how the people feel about their everyday lives. He demanded that the current administration report on the results of its policies. He went on the offensive against the previous DPP administration. Councilor Chen Chih-chung said his father made contributions to Taiwan’s economic development. Do the Taiwanese people have money or does their family have money? The answer is very clear to us all. 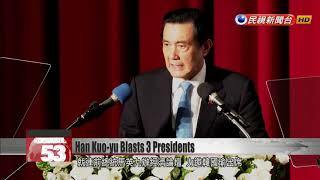 Even former President Ma Ying-jeou didn’t emerge unscathed. Ma had organized an economic forum and pushed for Han to attend. Waiting until after retirement to hold an economic forum – I don’t know if this is his psychology seeking to make amends or if he wants the people to be more concerned about the economy. Councilors in the pan-green camp blasted Han for spending taxpayer dollars on his U.S. visit, which they say is shaping up to be a campaign tour. Mayor Han’s heart is no longer in his role as mayor of Kaohsiung. He has moved to elevate his own status by criticizing three presidents. First he destroys, and then he highlights the idea that he can rebuild Taiwan. This is clearly presidential political rhetoric. The councilor said that by criticizing his own country, Han was doing good for neither Kaohsiung nor Taiwan.